It’s the perfect accessory for office trailers, food service trailers, tool cribs, lunch rooms, portable showers, sinks and fresh-water flush portable toilets. Wherever people work, the WaterWorksTM Water is delivered on demand by a on-demand electrical pump. Designed to operate on regular household current, the circuits are protected by GFCI and a low-water electrical shut-off. Only 46 pounds empty, it can be carried to the service site by one person. 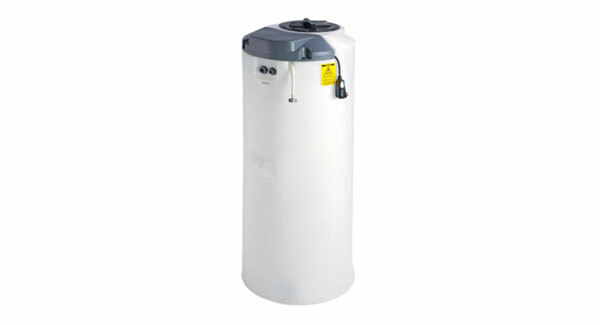 The dimensions, 60″ high by 23″ wide are designed to fit inside even the smallest closet. It can be plumbed to fill from outside the trailer. When it is time to empty and remove it, water quickly drains through its 1″ valve. Cleaning the inside is easy through the 10″ diameter access cover at the top. The tank is semi-transparent, so that customers or service personnel can tell at a glance how much water is left.